Christmas cookies have exploded! Growing up, we had the standard sprinkle sugar cookie cutouts, peanut butter cookies with chocolate stars and peanut butter cup cookies. These days, I try to top myself every year with something new and inventive, while still making the staples of course. These chocolate ginger cookies combine many of my favorite flavors. 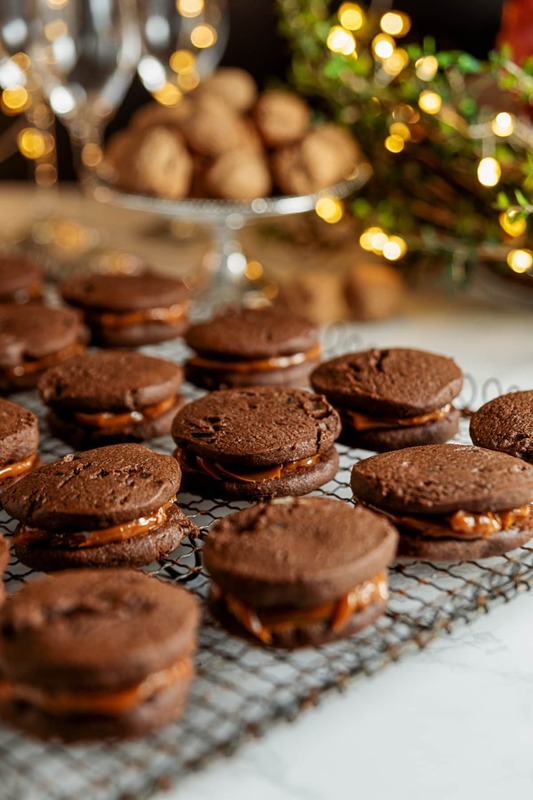 Rich chocolate with spicy warm ginger meld with the caramel-esque dulce de leche to make these cookies stand out from the rest. Many of the flavors are borrowed from traditional cookies, but when grouped together they become a new and festive change from the normal! In a stand mixer, cream the butter and sugars until well combined, 3-5 minutes. Scrape down the sides of the bowl. Add the egg and vanilla and mix until egg is incorporated. Scrape the bowl as needed. Add the molasses and mix until combined. Add the finely chopped crystallized ginger and mix. Using a sieve or strainer, sift together the flour, cocoa, salt, baking powder and ground ginger. Add to the wet ingredients and mix until no dry streaks remain. The dough will be stiff. Working with half the dough, shape into a log on a piece of parchment paper. Roll the parchment paper over the log. Using a bench scraper, create a tight log using the paper as a guide. Twist the ends and repeat with the rest of the dough. Place in the refrigerator at least one hour or overnight. The dough can be made up to 3 months in advance and frozen in an airtight container. Remove the dough from the parchment and cut into 1/4-inch slices. Place on parchment-lined baking sheet and bake in preheated oven until puffed and set around the edge, 8-10 minutes. Remove from oven and cool on the baking sheet for 5 minutes then finish cooling on a baking rack. Once all the cookies are baked and cooled, spread 1 teaspoon dulce de leche on the bottom of a cookie. Top with another cookie and continue until all cookies are completed. This will make approximately 20-30 finished sandwich cookies.